Actually, he’s not my friend – he probably sees me as more of a stalker. As he dined curbside, I slowly opened the Jeep door and grabbed a couple of shots with his face buried in the grass, then I made a serious misstep. I moved from behind the door and he flew off. I jumped back in the Jeep and gave him chase across the highway and into a housing development where I lost him. 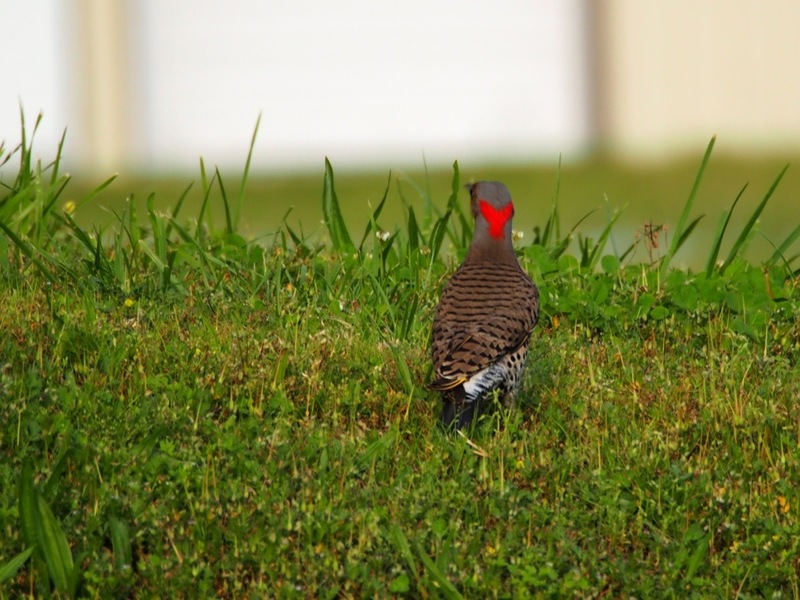 I took out my iPhone birding app and made the identification and headed home to gaze at my photos of a bird with his nose in the grass, all along wishing that I had continued to snap until he had at least raised his head for me. 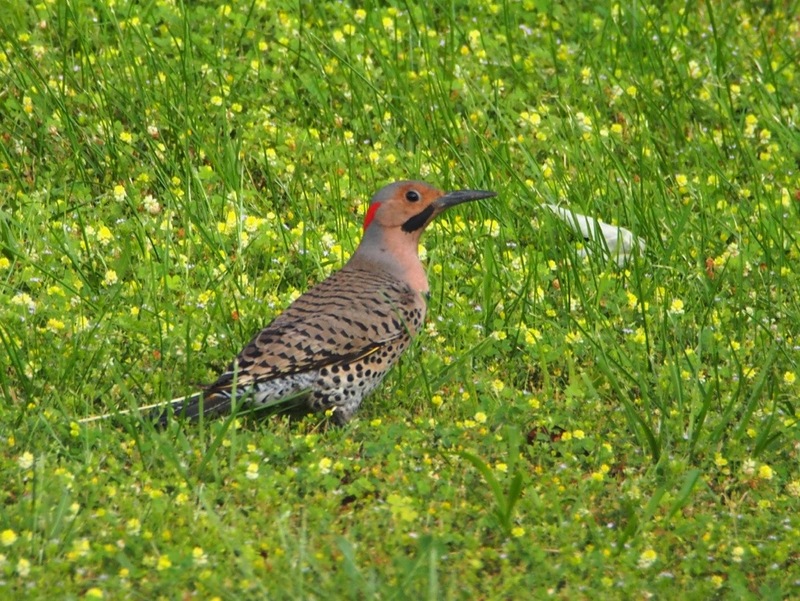 I get so excited when I spot a new species, and this time I had assumed he would be as calm as the woodpeckers I have cultivated relationships with at the Stone House. Having just come home from a trip where I shot lots of birds in park settings I just jumped the gun. 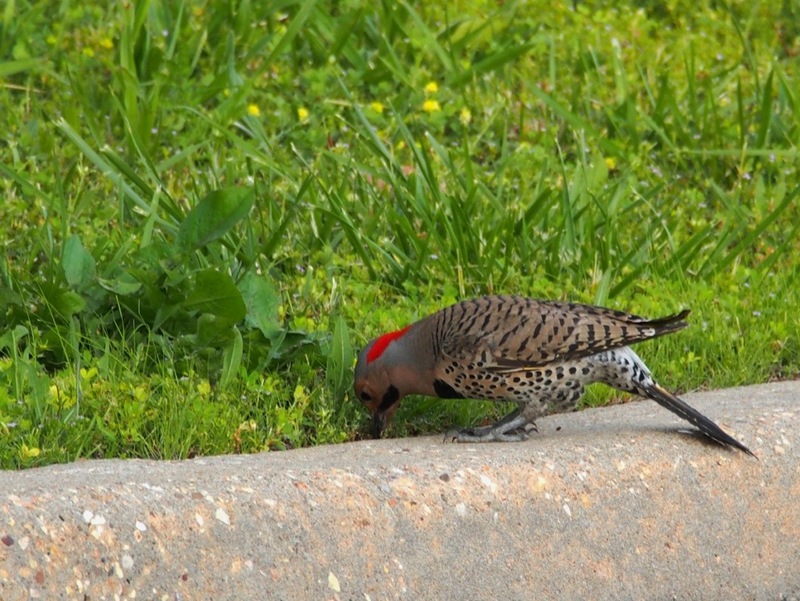 He was gorgeous – Northern Flicker – a variety of woodpecker that often feeds on ants and forages on the ground. The black mustache marks on the sides of his face identify him as a male. His flight was stunning, the underside of his feathers are a gorgeous gold color. 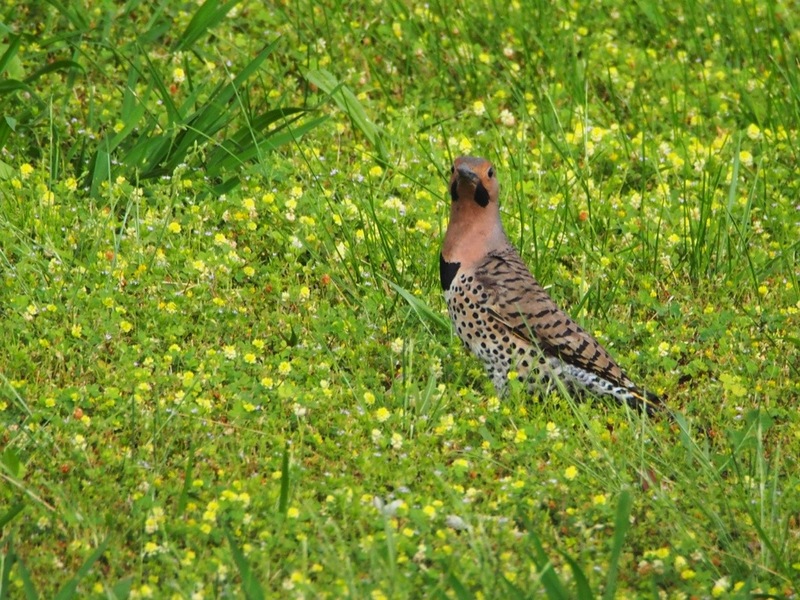 At first sight I mistook him for a mourning dove, but his movements were so much more deliberate, that’s what drew me from across the parking lot. And headed up the hill out of camera range. You can bet I’ll be stalking him again real soon. 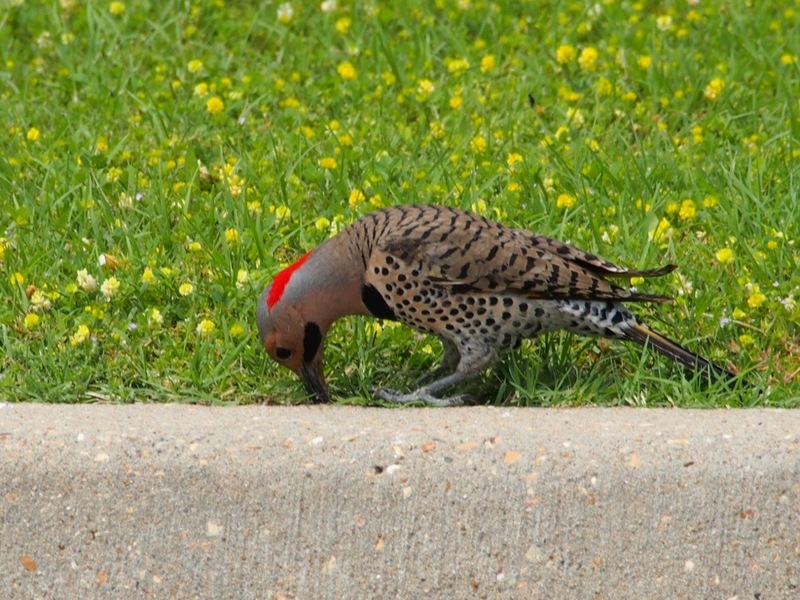 This entry was posted in birds, Ozarks, Photography, wildlife and tagged Northern Flicker, Olympus, Olympus E-M5, Woodpecker by artsifrtsy. Bookmark the permalink. What a outstanding site it is ? This post i can charmed. Thanks for your post. He has amazing color and texture. It’s amazing how nature can provide such wonderful things for us to see. Definitely inspiring. Thank you for sharing. His markings are really unusual – I notice that woodpeckers often have interesting patterns – Thanks for reading and commenting! He is pretty cool looking – I managed to track him a couple of times this week – hopefully he will get used to me over time. haha, the one that got away. 😉 hello, thanks for the visit. Thank you for the visit 🙂 I’m still stalking him. He’s pretty cagey. What an interesting feather pattern and colour. Love the red neck ‘mini shawl’. I’ll look forward to seeing some more shots of this one. LOL – Thanks – I’m glad to be back with the flock. 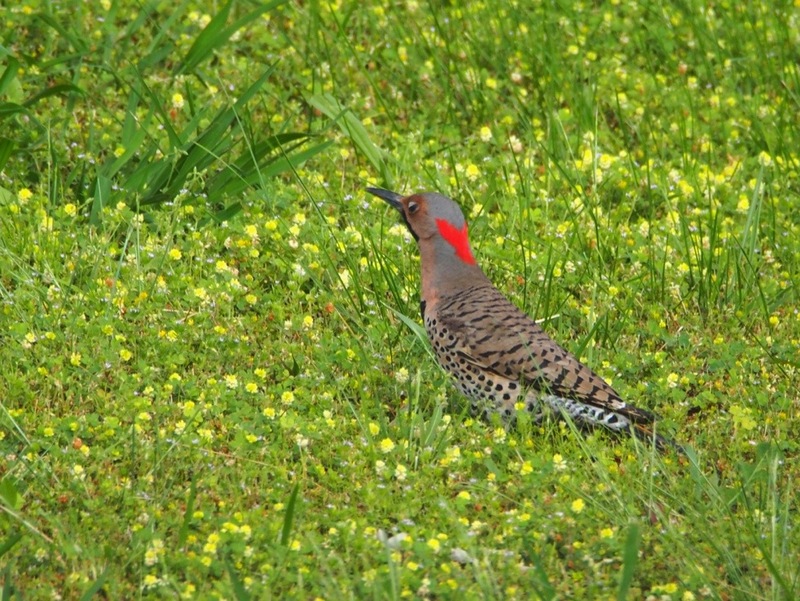 Terrific — no wonder you confused him with a morning dove — looks very much like one! The spots and color – right? But he’s not nearly as skittish. What a pretty bird! I love the splash of red. Nature is so beautiful. As usual, your photos of this bird are quite stunning. They capture moments of peace. Thank so much – I really find a happy place shooting birds. It is a peaceful thing. I love the markings on this guy. Well that was a great idea to go back to the same spot. It’s interesting to know where the tolerances are for different creatures though I’m convinced that personalities also make it inconsistent within a species. I agree with you, I know that even the smallest birds have distinctive personalities. I have a titmouse that has a mark on his eye that chats with me and has no fear of me – I’m part of his ecosystem. Something in his personality makes him bolder. Such a handsome birdie. You got some really beautiful shots of him. One of my favorites! I had four of them at the house I just moved out of. They would take turns at the suet. They also liked peanuts in the feeder. I know I had four because one time I saw them all at once! I was so excited! They were regulars all year round. They are here in Alberta. They usually like woods and trees but I’ve seen them in the backyard a lot. They are beauties and big! As the crow flies, the market is about a mile away – it’s interesting how different the species are there verses here. I hope some find their way to the Stonehouse, but I already have three kinds of woodpeckers active now. I had other woodpeckers come to the feeder too. I think they were more interested in the apple tree though. I loved to watch them. I’m not sure what kind of birds I have here at the new place. I haven’t put up my feeder yet. But with the coulies and open fields I should have a fair share of them. I find that in a hollow one ridge away the mix can be very different. I get few sparrows and they are packed with them over there, same with starlings – it would be awesome to have a flicker at the feeder though. Such beauty on a single bird! Why do birds suddenly appear every time you are near? What a beauty! !